The scene at the prison is a disaster. Following the Governor’s attack, the fences are down and walkers have retaken the grounds. Michonne, left alone outside with the hoard, starts to walk back inside the prison, attracting two walkers to get trapped against the spikes at the entrance. She disarms both walkers and takes them as pets. Just before leaving the area, she finds the zombified head of Hershel and puts him out of his misery. Traveling along the road, she finds some footprints and chooses not to follow them. Away from the prison and after a little time has passed, Carl leads his father, who is stumbling to keep up. They happen upon a biker bar and find just a single walker inside. While Rick has trouble taking the walker out with a hatchet, Carl kills it with his pistol. They find a small amount of supplies but seem to be at odds with each other. They end up finding a house and work their way through to clear it out, but Carl starts to yell to draw the walkers out and then turns his anger toward Rick. Checking out the upstairs rooms, Carl finds a TV, stopping for a moment and then yanking out the cord to tie up the front door. Later than evening, Carl brings out Shane and creates more tension between the two of them. In the bathroom, Rick looks at himself in the mirror and sees a broken, sick man staring back at him. Michonne falls asleep in an abandoned car and drifts into a dream state. She imagines that she is holding her child while talking with her lover and friend about strange occurrences at the museum. While preparing food to eat, she puts out the samurai sword and finishes preparing their food. All of a sudden, the two men are without arms, her child is missing, and the world has fallen into the apocalypse. 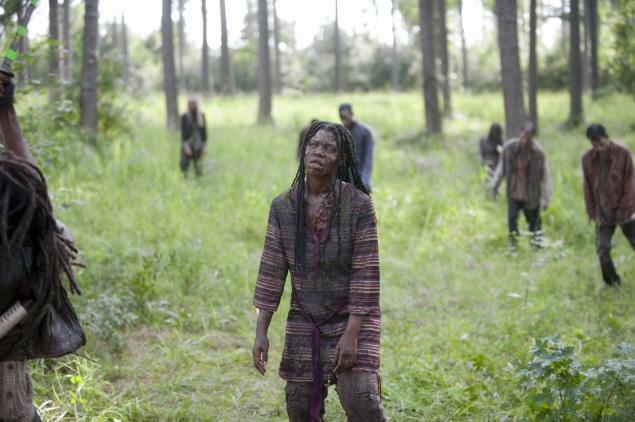 After waking up, she continues her journey with a pack of walkers surrounding her. Back on the streets, Carl pulls a spike out of the ground and tries to break into another house. After he struggles to get in, he finds a fairly stocked kitchen, including a giant tub of chocolate pudding. He continues on upstairs and finds the first two rooms are empty. The third reveals a trapped walker, which causes him to empty his clip and escape into the bedroom. The walker knocks him down and takes his boot, but he escapes and writes a message on the door to warn anyone else who might find it. He goes out on the roof to enjoy the pudding while the walker desperately tries to reach out toward him. 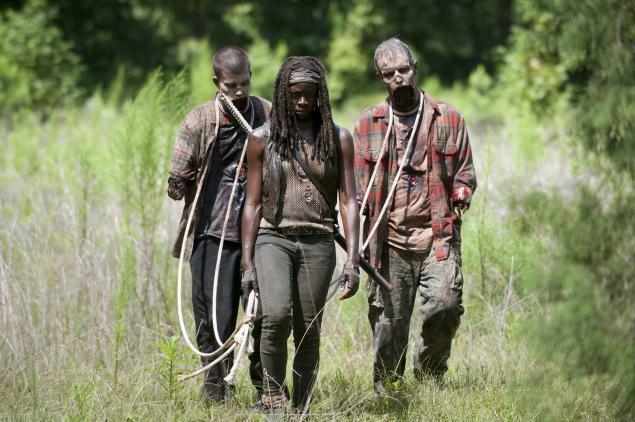 Michonne continues her journey with the walker pack and gets spooked by a walker that looks just like her. She finally snaps and takes out the entire pack in a rage. Left to the quiet, she begins to cry before moving on. She returns to the footprints she once found and starts to follow the trail. Back at the house, Carl has returned but Rick still has not woken up. All of a sudden, Rick starts to breathe heavily, making Carl think he is a zombie. Carl pulls out his gun as Rick reaches for him. Carl admits that he cannot pull the trigger but Rick finally speaks and tells him to stay inside where it is safe. Carl breaks down and cries, finally admitting that he is actually scared. Michonne stumbles upon the bar where Rick and Carl tangled with the walker previously, putting her on the same path that they traveled. She drops to the floor and starts talking to herself about Mike, her husband. She recounts how they could have all stayed alive and references a question that she finally feels she has an answer for. Rick finally wakes up and both scolds and appreciates Carl’s scrounging. Ricks admits that the life they once had was truly gone. He finally also tells Carl what he has wanted to hear, that Carl is truly a man. Carl finally forgives him as well. Michonne approaches the house and sees that Rick and Carl are inside, taking a moment to keep herself from crying. When she finally knocks, the guys pop up with their guns but Rick sees that Michonne has found them. Reaction: The return of the season brings the return of the Blogging Dead. The cast was limited in this return to Rick, Carl, and Michonne, with a brief glimpse of a dead Governor and zombie Hershel head in the beginning. There was no sense of how the rest of the group was fairing at the moment, but it was clear that these three survivors are struggling in very different ways. 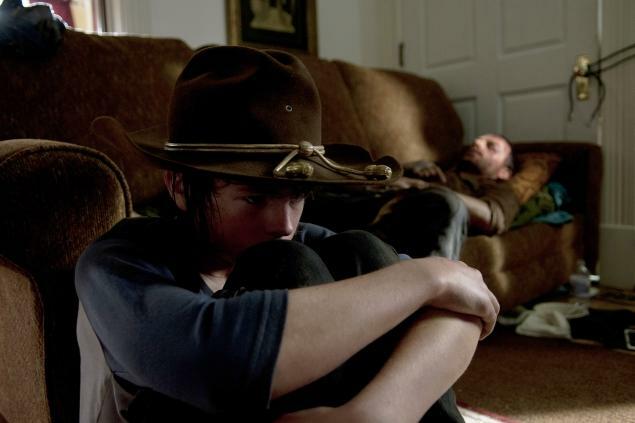 Rick felt like he failed his group and his daughter, but he still felt required to take care of Carl and take point. Since Carl did not want to listen, Rick just continued to stay hard-headed, until he became out cold from his exhaustion and injuries. When he finally came to, he realized that he was vulnerable and that Carl had done more than enough to prove himself after the prison, giving him some of the much needed appreciation that he had desired. As for Carl, he was a mess. Angry about what happened at the prison and at his perception of his father’s responsibility for the events, he threw some serious resistance toward Rick. Until he felt left alone, Carl was ready to fight and disobey at every turn. When left to his own devices, he felt a consistent need to prove his strength and independence to himself, even though he was shouting about it prior. He clearly struggled through a couple of walker attacks but still felt powerful for surviving and gathering more food. What finally snapped him out of his anger was the incident with Rick finally partially waking up and seeming like a zombie. Unable to pull the trigger, he was ready to give himself to a zombified father but was shocked to find that Rick was still alive. He was willing to die rather than kill a walker version of Rick. When Rick finally woke up, he finally admitted that he needed his father. Michonne’s story surprised as an in-depth account of her complexity. The dream sequence was the background that finally explained the two disarmed walkers that were with her when she first appeared in the show. The dream actually highlights something else more than her background though. She had to become more hardened after the walkers took over the Earth, but she was not so hard while the people she loved were still alive. She had discovered that she had skill with a blade, but the two men seemed to resent her a bit for it. They had become more of liabilities, whereas she had become an asset. This dream occurred around the time that she had to take new walker pets, which symbolized falling back into old ways which included becoming guarded again. The berserk attack then symbolized a choice of life and detaching her past from her ability to move forward. The rest of the gang is still out there. Next week should reveal where the rest of the group has ended up.